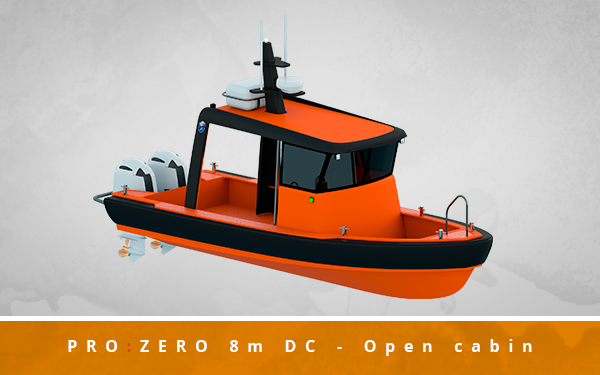 The vessels of the ProZero range in the offshore segment are custom made to fit the high demands of the offshore windfarm industry, the oil & gas industry, search & rescue or of the seismic industry. These industries are characterized by the rough environments and by the toughness needed in the vessels. The ProZero line was designed to withstand the pressure of the elements and is custom made for the specific needs of the customer. The focus is on high strength and resilience. The ProZero Turbine Transfer Daughter Craft is the first ever purpose designed Transfer Daughter Craft designed specifically as a transfer daughter craft for the far offshore windfarms, offered to the marked. 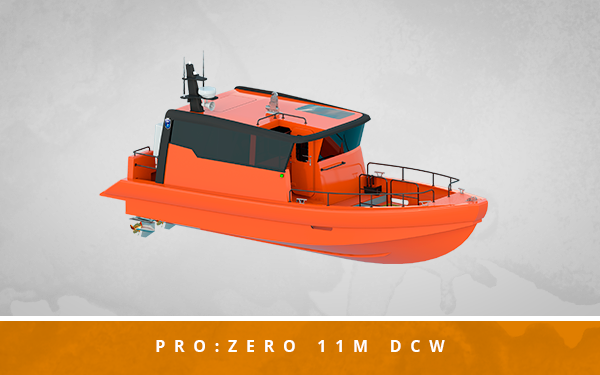 The ProZero 11m Wind Farm Service Vessel is a fast Daughter craft, specifically designed to optimize the safe transfer of personnel to and from offshore installations. It is a fast crew- and passenger transporter, capable of performing tasks that require economical logistics and high flexibility. For this reason, the boat has been specially designed with easy access from both fore- and aft deck, with high focus on the swift accommodation of passengers in the cabin, and cargo on the foredeck. Safe transfer to- and from the boat, is ensured through a specialized boarding area bow and fender. Tuco Marine Group supplied the ProZero 11m Wind Farm Service Daughter Crafts for two of the Ulstein X-stern vessels, that have been delivered to the German based Bernhard Schulte affiliate WINDEA Offshore GmbH. These vessels will charter for Siemens, and their daughter crafts were delivered from Tuco Marine in Q2 and Q3 2016. The daughter crafts - the "ProZero 11m Wind Farm Service Vessels" - are from the ProZero series. The hull design is based on the well proven and tested hull from Tuco's Guard Series. Tuco has produced and continuously developed the series since 2002. "In the design process it was important for us to create a transfer vessel optimized for the demands of a SOV daughter craft in the offshore wind industry, meeting the high demands for safe transfers and comfortable travel” says Jonas Pedersen, Director of Tuco Marine Group and continues; "Therefore, we have based the entire design on meeting the customers’ needs and wants, presenting a Daughter craft where all efforts are targeted towards this specific industry." "This boat is designed for safe launch and recovery and can be optimized for both single point hoisting or to access a stern garage on a mothership. To further improve comfort, efforts have been made to reach a high level of redundancy enabling the vessel to work as a stand-alone that can also make transfers to and from shore " continues Jonas Pedersen.